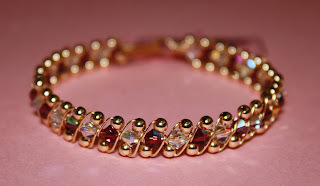 First bracelet I ever made. A 34-pieces 4mm Bicone Crystals AB purple velvet and white crystal AB combination wrapped with 3mm 14k gold filled ball spacer using 14k gold filled jewelry wire. You can customize your choice of crystal colors. Thanks for sharing such a multi color crystal Bangles. Keep it share more Bangles.